When I moved into my apartment and stood for the first time in the middle of my small, furnished kitchen with everything neatly packed away, the daunting realisation had finally hit me: I have to cook. I have to switch this stove on, chop vegetables, cut meat, beat mixtures in bowls, pop things in the oven, leave dishes to set in the fridge, and (hopefully) freeze delicious leftovers for another time. It scared me. Where do I even start? No sooner than I began experimenting with quick and easy recipes did I realise how many lifesaving and time-saving goodies there are at the grocery store. My sister had once advised me on one of Ina Paarman’s products, and since then at no point am I left with ‘nothing’ to prepare in the last minute. Whether you’re still learning how to cook or already know the ins and outs, Ina Paarman’s product range will make baking and cooking easier. First, many of the products taste good, are convenient, quite affordable and halal-certified (the ones that I use are certified; I have not checked every product of hers). Here are my 5 favourite Ina Paarman products that complete my kitchen. There’s a variety of pasta sauces; one of my personal favourites being the Tomato, Olive & Chilli. It has pieces of olive in and has a spicy kick to it – goes very well with spaghetti. You just have to empty out the sauce in a bowl and heat in the micro, or in a pot on the stove. That’s it. Toss in some meatballs and enjoy! (We even eat it without the meat and it goes down well with cool juice). The smell of this marinade alone can make you salivate. It has a pungent scent and is so delicious! The instructions on the bottle say it’s ideal for chicken and seafood but I’ve only ever used it for cooking or baking chicken. 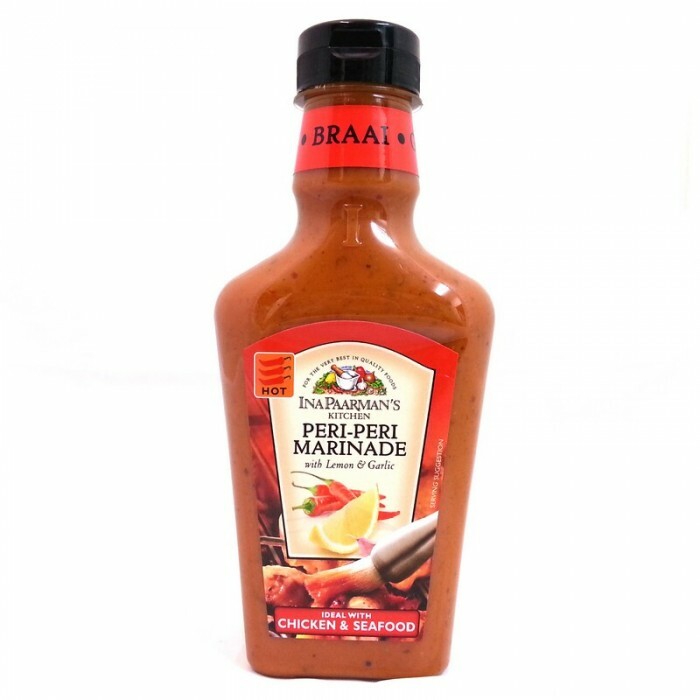 And if you’re going to braai, you can use the marinade as a basting too. I’ve tried cutting down on eating potatoes but I just can’t. And now that I use the Potato Spice, it’s almost impossible. Season your chips or wedges with this – it is absolutely tasty! The seasoning is a mix of a few ingredients that create just the right flavour for your fried or baked potatoes (I don’t even use vinegar after frying them – it’s not necessary). I love brownies. The recipe I use takes time and effort… and sometimes I don’t have the energy for it. Ina Paarman’s Chocolate Brownies mix, which comes with choc chips, only requires about 4-5 ingredients (like egg, milk, and such). It takes me 9 minutes to mix everything together and pop in the oven (yes, I timed myself). No chocolate sauce is needed, simply dust icing sugar and you can munch away once they’re out and cooled. I’ve tried other brownie mixes and they just can’t compare. I’m not big on fresh cream and hardly use it, unless for desserts. So if I’m going to decorate a cake or cupcakes, it’s going to be with buttercream icing. The vanilla flavoured icing is the best from the three available; which are strawberry, chocolate, and vanilla. 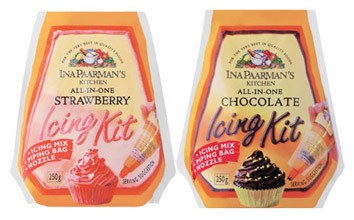 The icing kit comes with a nozzle that you use with the plastic bag the icing comes packaged in. I can’t tell you how convenient this is. All you need is some butter/margarine and a dollop of lemon juice for the smoothest, yummiest vanilla icing. The package says it ices 24 cupcakes but I’ve generously iced about 28. If you live in Cape Town, I suggest you visit the Ina Paarman factory shop in Diep River. The products are priced much cheaper than the grocery stores and you can pick up some of her cook books at a pretty good price too. 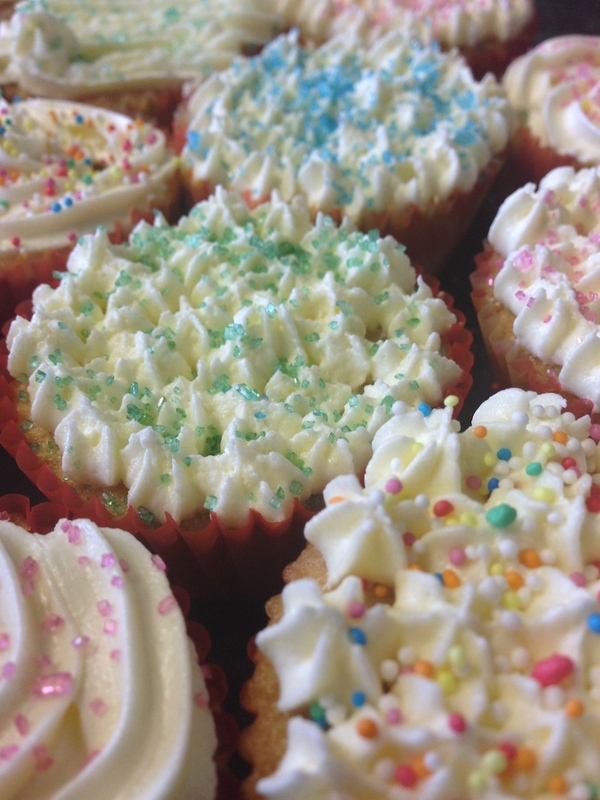 One of the times I used the vanilla icing on cupcakes. Feel free to give them a go and let me know. Thanks for this! We like the Olive Pesto. Now will try the sauces and chips spice. Ooh, we should give that a try! Thanks! Keen to try the brownie mix now!